Another variation on a dataset location is the ability to read data from a URL. Defining a URL dataset to be read is as simple as entering the URL into the Dataset field within any of FME’s dataset selection tools. After reading, the data will be downloaded and used just as if it were a normal dataset. Open the Add Reader dialog. Note: In the Reader parameters dialog for most formats, the parameter Use Network Authentication is visible when the dataset is a URL. Click OK to add the reader to the workspace. Share the file publicly and copy its ID number. URL datasets can be read using either HTTP or FTP. FME can read a dataset that is both a URL and a zip file. However, it is not necessary for all URL datasets to be zipped; non-zipped file datasets can also be read. 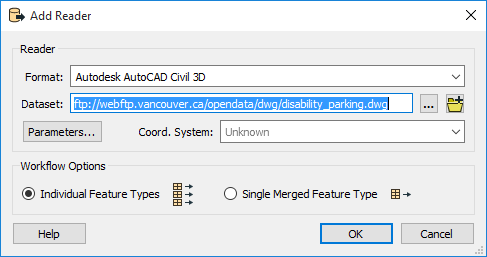 FME cannot currently write data directly to a dataset defined by a URL. In this scenario, the data must be written out to the local file system, and then uploaded to the required location using a shutdown script or an HTTPFileUploader transformer.